Yemen faced renewed turmoil on Sunday after government forces shot dead up to 26 opposition protesters demanding the resignation of the country’s wounded president, Ali Abdullah Saleh. The worst bloodshed in months came amid mounting suspicion on the streets that Mr Saleh had embarked on a fresh ruse to cling on to power from his hospital bed in Saudi Arabia. The president has defied predictions of his imminent downfall since he was badly wounded in an attack on his palace in the Yemeni capital Sana’a on June 3rd. 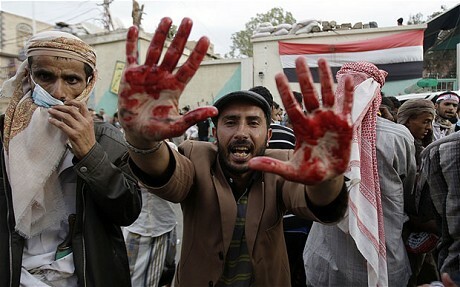 Ever since, demonstrators seeking an end to his 33-year rule have remained in a protest camp in central Sana’a. But yesterday, amid reports that Mr Saleh had initiated yet another series of negotiations to transfer power, frustration spilled over. Tens of thousands marched out of the camp and surrounded state television and other government buildings. But when they attempted to mass outside the presidential palace, the security forces opened fire with anti-aircraft guns and automatic weapons. The protesters, who had been largely peaceful according to witnesses, were also shot at by pro-government snipers positioned on rooftops. Civilian supporters of Mr Saleh later joined the fray, charging the crowd with swords and rifles. A number of protesters were reportedly beheaded. At least two opposition officials were among 500 people wounded, according to hospital medics. The renewed violence raised fresh fears that Yemen, already one of the region’s most volatile states, was on the verge of descending into civil war. The opposition said it would step up its protests until Mr Saleh was finally forced from office. “This peaceful protest was confronted by heavy weapons and anti-aircraft guns but we will not stop and we will not retreat,” said Mohammed al-Sabri, an opposition spokesman. On three occasions before he was wounded, Mr Saleh promised to abide by a regional peace plan that would see him hand over power to his vice president until free and fair elections could be held. Each time, he reneged at the last moment. Considered one of the wiliest leaders in the region, Mr Saleh has shown a remarkable knack of survival. Deserted by former allies in his tribe, party and army, and barely escaping with his life in the attack on his palace, Mr Saleh has relied on the powerful political network built up by his family to cling to power. But the political turmoil has resulted in a security vacuum that has seen Islamist militants linked to al-Qaeda expand their remit in the country’s lawless hinterland â€“ with some even succeeding in capturing and holding a regional capital in the south of the country during the summer.